I have often felt that there are movies, and then there are Disney movies. Those people at the Walt Disney Company seem to bring magic to whatever project they take on, even if it is just producing. Their latest, director Jon Favreau’s adaptation of Rudyard Kipling’s classic tale The Jungle Book definitely works to validate their reputation as magicians. The tale of the little boy abandoned in the Indian jungles and brought up by a pack of wolves is synonymous with childhood, or should be. I remember my parents telling me the story when I was a little child, bringing alive all the characters until I could almost pretend that the animals were my own dearest friends. Later, I spent many delightful afternoons watching Disney’s earlier adaptation of the tale on TV over and over again. So when I chanced upon a poster of the latest movie adaptation of the tale, I made a beeline for the theatre the very day the film was released here, this last Friday. Directed by Jon Favreau and released in 3D format, the movie is a feast for the senses. This was also the first time that I watched a movie in 3D, and it was a rewarding experience. The only time I had watched a 3D piece was at Science City, the science and technology park in Kolkata. There the 3D effect is such that the characters seem to jump out of the screen towards the viewer. That can get quite unnerving at times, especially since the piece I viewed there had mice jumping out and an enormous snake opening its jaws at the audience. But here the third dimension was shown inside the screen, almost as if the screen were a hollow tube in the direction opposite to the audience. The sense of depth did much to add to the beauty and real feel of the movie. All the time I was watching the movie, I almost felt like I was in the jungles myself, running about with Mowgli down the long stretches of dense undergrowth. I must admit – shamefacedly – that I do not remember the original story by Kipling in detail. But that I think has helped me be less critical of the discrepancies between the story and the movie, because frankly that does not matter. What does matter is the way you are swept off your feet and whisked into Mowgli’s world from the very opening scene. 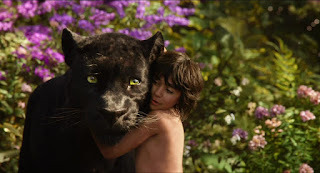 The camera follows Mowgli’s route as he competes with the wolf cubs in a race with Bagheera the black panther training him to become more ‘wolf’. Right from the start one feels Mowgli’s anguish, his desperate attempts to fit in to the world of the wolves, to give up all his ‘man-ness’. He is frustrated when he is refused entry to the wolf council and watches from afar as the council repeats its vows about ‘the law of the jungle’. The movie follows a linear narrative, right from the time of the great drought and the ‘Water Truce’ at the Peace Rock where all the animals gather around and drink together. Hunting is forbidden because water is more important than food. It is there that one first encounters Sher Khan, the great Bengal tiger, the one creature that every animal in the jungle fears, that even Akela, the mighty leader of the wolf pack does not challenge if he can help it. He is despised by the jungle community for his wanton cruelty, his tendencies of hunting for pleasure. But Sher Khan himself has a deep seated hatred for man, ever since one man – Mowgli’s father, as we later learn – burnt his face with fire and blinded his left eye. He is hell bent on killing Mowgli, and vows to take the man cub’s life once the rains return and the Water Truce ends. This puts the pack in a dilemma, which Mowgli himself relieves them of by promising to go back to the man-village from whence he came. Accompanied by Bagheera he sets off on his journey home, and here his adventures begin. There is a chase sequence just afterwards where Bagheera senses Sher Khan’s presence in an open stretch of tall grass and manages to warn Mowgli mere seconds before the tiger leaps onto them with a blood curdling roar. That sequence first made me realize exactly how good the animation really was; I had completely forgotten that the animals were just computer generated cartoons and not flesh and blood creatures, and I flinched at how narrow an escape Mowgli had from Sher Khan. The sense of reality was further enhanced in the subsequent sequence of Mowgli escaping with the help of a herd of Nilgai running down a muddy ravine. The brilliance of the cinematographer Bill Pope is captured beautifully in a scene where a few drops of water get splashed on the screen from the hooves of the Nilgai, adding to the sense of urgency and danger. At no time does the movie exude a false sense of comfort and security, despite being a children’s feel good production. There is a sequence of a landslide caused due to the heavy rains that brings down an entire face of the cliff, washing off the Nilgai and Mowgli to the swirling river below, a reminder of exactly how dangerous the Indian jungles actually are for all its inhabitants. The story of Mowgli’s childhood where he first hears of the ‘Red Flower’ of the humans that destroys everything it touches is told by Kaa the python while she hypnotises Mowgli and tries to crush him in her deadly embrace, just to be saved in time by Baloo the bear. It is an interesting touch to change the python’s gender, and personally I feel that this is somehow more apt; Kaa is almost the femme fatale, the siren whose attraction is irresistible to man. Only I wish they had included that one line so synonymous with the great snake – ‘Look at me, come to me!’ I remember being terrified and fascinated at the same time as a child of that one line that had even held Baloo hypnotized in the original tale. Baloo the bear is a sweetheart; the epitome of sloth who usually had others get his honey for him but eventually climbed a steep rock face and fought a monkey pack to save little Mowgli. Baloo encourages Mowgli to stop worrying about becoming a wolf and embrace his ‘man-ness’. He convinces Mowgli that there is nothing wrong with his little ‘tricks’ that Bagheera so detests; that in fact it is the ‘Mowgli way’ of doing things. It is those tricks that Mowgli uses to gather honey for Baloo, and eventually even rescues a baby elephant from a trap set by the human, an act that astonishes his friends and gains him the respect of the mighty elephants, the lords of the jungle. In the meantime, Sher Khan kills Akela and terrorizes the wolf pack, waiting for Mowgli to return so that he can kill the man cub. Baloo and Bagheera both keep this news from Mowgli, but when Mowgli is kidnapped by the ‘Bandar-log’ and taken to their king, King Louie the Gigantopithecus, the large ape tells him of Akela’s death while trying to coerce the secret of the Red Flower from Mowgli, which he thinks will make him like the humans. Baloo and Bagheera manage to fight the monkey hordes off, and King Louie dies when the old structure of his palace collapses on him, but Mowgli already sets off to avenge Akela. He steals fire from the village nearby and runs back to the pack, starting a jungle fire behind him. There the final battle of the animals against the evil tiger is hair raising just as it is beautiful. Eventually Mowgli manages to kill Sher Khan using one of his tricks, this time encouraged by Bagheera himself to fight the tiger like a man and not a wolf. The movie ends with the same shot as the opening scene; of a race between Mowgli and his brothers and the panther, only this time Mowgli wins by his tricks which are now an accepted part of his identity. There is a sense of closure, the coming of a full circle, where Mowgli has now truly become a part of the jungle community with all his uniqueness, his man-ness. As the narrator, Bagheera ends with the wondering pronouncement of how he had never seen all the animals of the jungle come together before as they had done in the destruction of Sher Khan, the bane of the jungle. The one thing that struck me was the extent of power and ability in the human voice. All the animals, all the computer generated characters were brought to life, were given emotions and personality merely through the voices of talented actors. Rakhsha, the mother wolf was voiced by Lupita Nyong’o, and she brought the quiet dignity and strength and fierce motherhood to the wolf who had taken the man cub in as one of her own. Bagheera, voiced by Ben Kingsley exuded power and self restraint and love and companionship and even the occasional subdued humour. The wonderful Bill Murray voiced Baloo the bear, and no one could have brought out the character of the happy go lucky bear who lived life his own way and could die for his friends without a second thought better than him. The lovely Scarlett Johansson as Kaa had a bit role with no more than a few minutes’ of dialogue, but she was a fantastic selection with her sultry voice that was irresistible even as it oozed danger. Christopher Walken voicing King Louie the Gigantopithecus was comic even in his hostility and positively scary demeanour. And Idris Elba as Sher Khan was just phenomenal. That a man could bring so much hatred and power and pure evil into a cartoon with just his voice has to be seen to be believed. The director deserves applause for just his selection of actors to voice the characters if nothing else. Twelve year old newcomer Neel Sethi as Mowgli is an appropriate casting selection. He brings in energy and charm even as his demeanour truly speaks of a boy brought up among the animals. What is commendable is how natural his acting is, especially since all the talking he does is essentially to himself on set. He had to imagine all the characters that he was addressing, and he does that beautifully. But unfortunately for him it is his imaginary co-stars who really steal the spotlight, making him look a little like a supporting artist. The Jungle Book is a tale of joy and laughter, of tears and pain, of love, of companionship, of adventure, of acceptance. It is wonderful how a good author or a skilled director can pack in so many flavours of adult life in a tale that is ostensibly for children. Do watch the movie, in the movie theatre if you can. The big screen and the 3D effect will really make a difference. And do you children a favour and take them along. You will be gifting them a lovely memory of childhood that they will look back upon for years to come. Wow, what a review! I cannot pay a higher accolade than to say that it makes me want to go to the cinema - and you know what that means. And I am glad we told you the story when you were a child. Pupu, I’ve got to say with a huge smile that you made me shake off a thousand and one excuses (and what-seemed very good reasons) and got me to go to the cinema. I never would have if it hadn’t been for this marvellous review of yours and last night I made up my mind that I’d go and so I did today. Thank you very much. This was my first proper 3D film watching experience. What I enjoyed is the feeling and space of being in that humongous jungle and running along with the tale. It almost felt like the next best thing to actually being in a jungle. Secondly that wolf pup Grey and the baby elephant made me want to bring them back home. Thirdly, I can tell you that your review got me to re-read The Jungle Book (on Saturday night) that I found on my bookshelf but I was left scratching my head. Because the parts that I remembered I didn’t come across this time in the book! I remembered quite frankly nothing that was actually there in the book. I don’t know exactly why they changed the roles of Akela and Baloo and even Kaa’s role in the film but I do wish that they hadn’t so ignominiously done away with Akela within the first few minutes of the film and I wish Mowgli had sort of said a bye to little Grey when he was leaving the first time. Grey looked so forlorn after Mowgli was gone. All the other scenes with your vivid and mighty descriptions made me anticipate them while on the edge of my seat. I sort of got lost in the grass with Bagheera’s warning just before Sher Khan pounced and that cliff crashing scene and with Mowgli making an unbelievable get-away by leaping into the river was breath-taking. Kaa raised the bristles on my neck quite involuntarily. I rather enjoyed that happy song-scene where Mowgli and Baloo float down the river while splashing each other even if Mowgli sounds utterly off-key! I enjoyed the film in the theatre and it was a good experience but I have to honestly say that all in all, I find your review more captivating than I found the film on the 3D big screen.